Here is a list or what qualifies for completing your volunteer hours. Work a shift of concessions during the season or preview. -opportunities will be posted on DIBS as needed. Be a part of the set up or clean up crew during the preview. -opportunities will be posted on DIBS as needed. Work a shift during equipment pick up. -opportunities will be posted on DIBS as needed. Work a shift during equipment turn in. -opportunities will be posted on DIBS as needed. Work a shift at equipment garage clean up or garage organization. -opportunities will be posted on DIBS as needed. • Flag Football Head Coach counts towards volunteer hours if you have player in tackle. Asst Flag Coaches do not count toward volunteer hours. • Running the scoreboard, chains and field set up/tear down do not qualify as completing your volunteer hours. These functions are considered helping out your team for their games. Your Team Manager may want to set up a schedule so everyone does their part in helping the team. All volunteering is done through the DIBS section of our website. All other opportunities will be posted on DIBS as needed. This list is subject to change. NOTE: Volunteer Deposit Checks will be collected at equipment pick up. We will be offering parents the option to "buyout" the volunteer hours. The volunteer deposit for the 2015 season is $150 (1 DIBS session per family required) or you may choose not to volunteer and pay the $100 buyout at the time of registration (no hours will be required). If you do not want to volunteer in the 2015 during the registration process you will choose the option to "buyout" your hours. At the end of the registration the $100 fee will be added on. This option can only be done at the time of registration. If you decide to volunteer you will be required to complete 4 volunteer hours or 1 DIBS session per family in order to have your volunteer deposit returned/destroyed at the end of the season. Example: If you have four players registered you will be required to complete four volunteer hours. If you have one player you will be required to complete four volunteer hours. *If you choose the option to volunteer and pay the deposit, but you do not complete the required hours (4 hours/1 DIBS session per family) you will then forfeit the $150 deposit. We are utilizing the DIBS system to run our volunteer opportunities. You DO NOT need a separate DIBS account to select volunteer hours this season -- your DIBS account is tied directly to your registration. Our new AFA website requires you to create an account in order to register for volunteer opportunities. Create Your Andover Football account. NOTE: If you already have a log in with Andover Baseball, Andover Athletic Association or Andover Youth Hockey you can use the same log in then you will need to click "Join the Network" to the left. You will receive a verification email after submitting your account request. You must click on the link provided in the email in order for your account to become "active". Then you go can get into the Dibs system and register for volunteer hours. When you go into the DIBS session, select the volunteer session you would like to volunteer for. Once you are inside the session there will be a date range which defaults to 30 days, extend the second date to the year 2011 and click apply. Now you should see all the available opportunities. 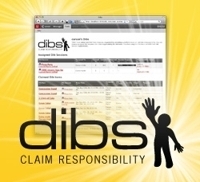 Select the time & place that works best for you and claim the DIBS item.